I’m very excited about this project because it was free! I used left over material from my Drop Cloth Curtain (the original drop cloth was 4’Wx15’L). fyi: the drop cloth curtain has been replaced with a new curtain…pics soon. Originally, I wanted to make a slipcover (i love slipcovers!) to lay over the bench so I could wash it but I really wanted it to be secure and not move. I would be adjusting it all the time with a slipcover. blah. The new bench really dresses up the entry and gives it style. I love it! Now, if only I could decide whether or not to paint the bench legs. What do you think? Paint or not to paint? 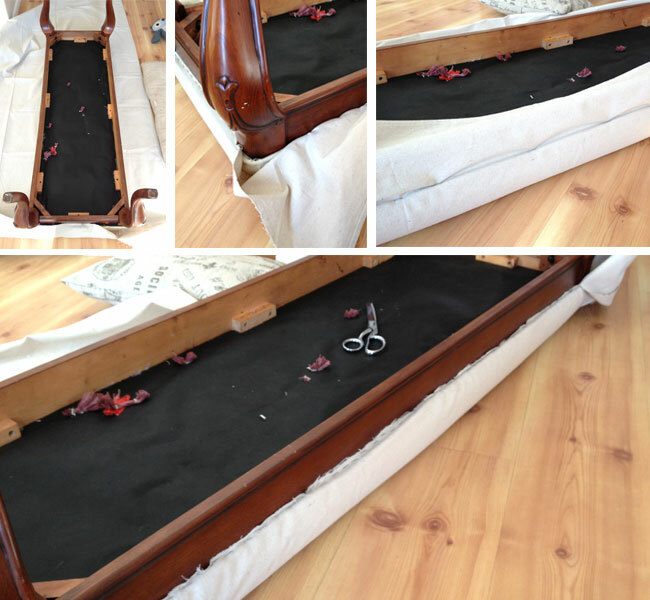 I started by laying the bench upside down on the drop cloth and stapling one end. I didn’t cut the cloth until it had been stapled because, knowing me, I would’ve made it to small or something. I moved onto the sides until it was all done. I left the corners unstapled so I could do them all at once after the edges were done. I was careful to lay the bench on the cloth so I could use all the seams for the skirt…because this is a no sew project and I don’t like sewing seams and I could just use the ones already available. That’s just what I did. Then I ironed each pleat using my ruler and stapled it on. So much fun!! After all the staples were in, it was ready to be flipped over. I was more than happy with the results! Now, if I could only decide to paint the legs or not. decisions, decisions. What do you think? Turned out pretty good, didn’t it! I love it when a plan comes together…haha! I’m linking up with Make the Scene Monday, Made by You Mondays, Get Your Craft On, Monday Funday, Creative Spark, What We Accomplished Wednesdays, Think Tank, Transformation Thursday, Inspiration Gallery , Fabulously Creative Friday & Chic on a Shoestring Decorating. So many great projects on these sites, check’em out! That bench skirt is beautiful, but the entire wall is incredible!!! LOVE it! Thanks Angela! You’re so sweet! The pleats were totally out of pure laziness and because I broke my sewing machine needle making curtains. ;) Thanks for pinning and following. I love how this bench turned out. 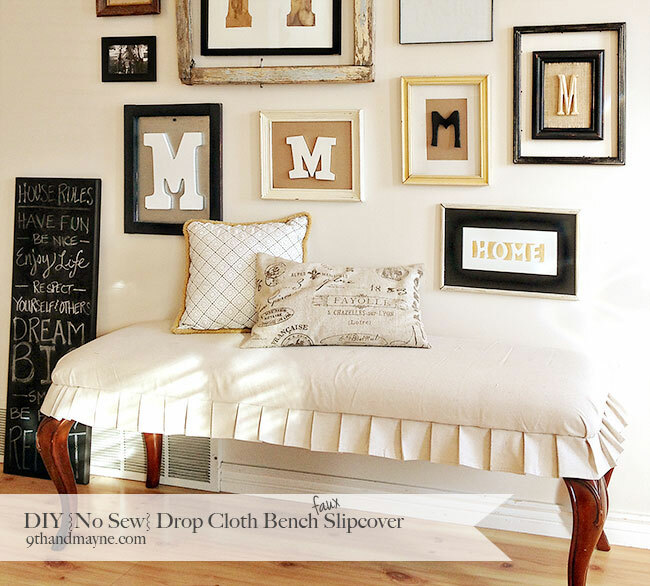 The whole look, gallery wall and bench…fabulous! Thank you for sharing this and thanks for stopping by the blog as well. I am sharing on FB and pinning:-) Awesome job! Thank you so much Dalia! Whoaaaaaaa! What a fantastic job you did on that bench! It looks very upscale and elegant. And I love the legs just the way they are. They provide nice contrast and balance out with the frames above. You have a treasure trove of a blog here. So many inspirational ideas. You are so clever and wonderfully crafty, and I adore those poppies you painted! Thank you so much Bella! I’m so excited you like my blog and my poppies….I’m a huge fan of yours. :) Thanks for visiting! I LOVE your blog! That bench is absolutely amazing! Would you mind if I shared it on my facebook page? Sorry! I just saw your comment. I would love it if you featured my bench on your Facebook page….so excited! I LOVE your blog! Thank you Melissa! I love painted furniture also but I agree with you….the wooden legs looks good in the group. Your bench is beautiful. You have a good eye for beauty. And I love your wall of Ms. I’ll be coming back for inspiration. Thanks Lori! YOur so sweet! I love your bench — but that wall of “m” art? Perfect for my daughter’s room! Love it and pinned it! Don’t know if my comment went through or not – so I’ll do it again just in case! Love this! Totally pinning! So simple and cute!! I would keep the legs as is – it has a nice classic look! And I LOVE your letter wall! New follower! LOVE LOVE this! Looks perfect with that incredible gallery wall! thanks so much for sharing with us at Monday Funday! Thanks so much! I’m glad you like my bench and wall. I love your blog…so many great projects! Thank you Jami! I’m happy you visited too! I just hopped over to your blog and WOW, it’s lovely!! Awesome! Makes me wish I had a bench. 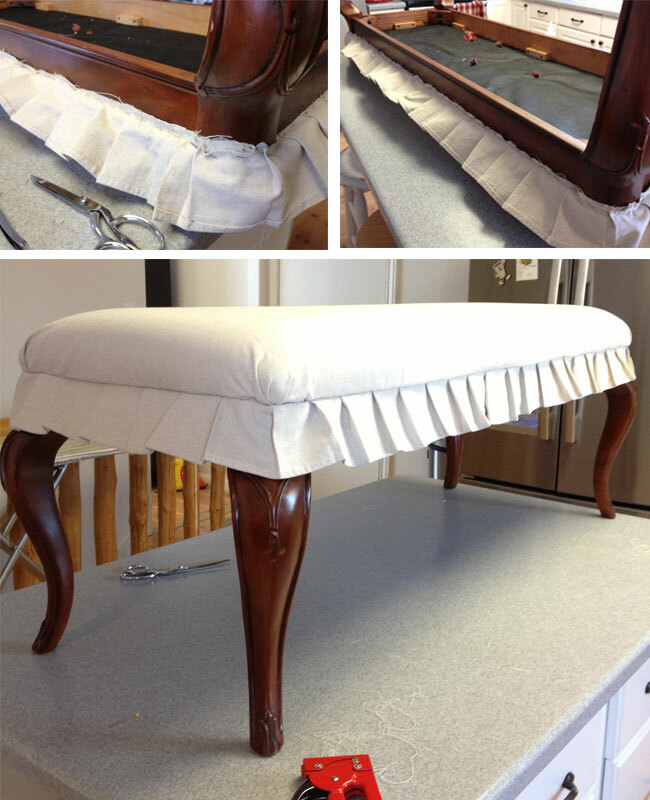 Your bench looks wonderful with this drop cloth cover. I love it!! Thanks so much for linking to Make the Scene Monday at Alderberry Hill. You are being featured tomorrow morning! Thank you Sarah! I’m so excited you choose my project to be featured on your blog! You made my week! Love, love, love this!! What a difference it makes! 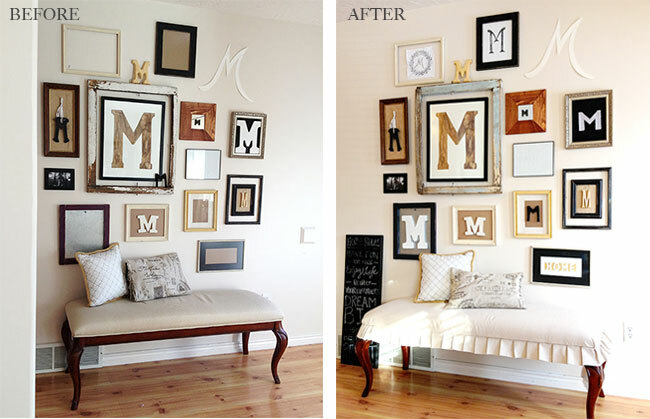 And your gallery wall is amazing too. Thanks so much for coming out to the party at Clean and Scentsible. I will be featuring this tomorrow. Enjoy your Sunday! Thank you Jen! Thank you for featuring my project. I’m so excited! I love your bench!!! You did a great job with the new upholstery! The skirt is too cute! I think I would go ahead and paint it black. It would match some of your frames then, blending in with the decor better. Thank you so much for featuring my project! So excited! WOW!!! This is stunning! So beautiful and I can’t believe how easy you made it look!! Thinking of where I can do this in my house!! Bravo! It looks great! I would take stapling over sewing any day! Beyond cute! Beyond Amazing…pinning it! Thank you Amanda! I saw your cute outfits on your blog but I can’t leave a comment. Weird! Thanks for stopping by! Brilliant! It looks so pretty and really brings a sophistication. Your gallery wall is looking fabulous also. Looking forward to seeing the entire wall when it’s done! I absolutely love how this turned out!! Just beautiful! 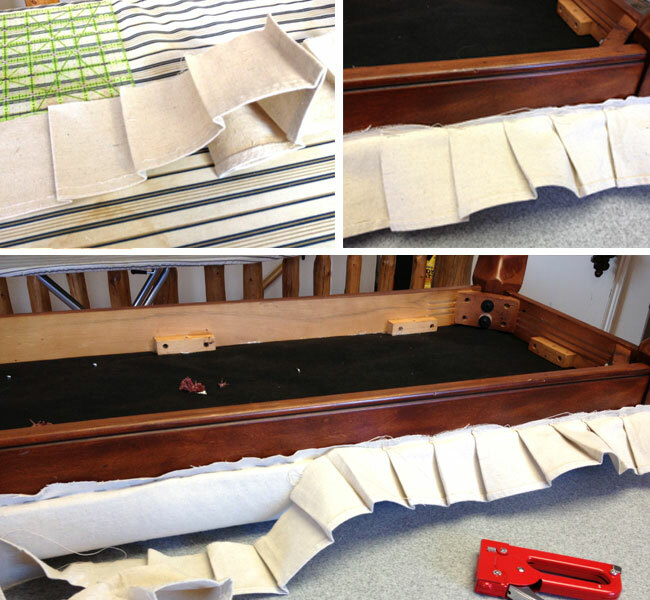 I can’t sew to save my life so always looking for good no-sew tips like this. Found you through Thistlewood Farms FB post. Would love for you to link up to my party, Flaunt it Friday. My friends(aka:readers) would love this! Thank you Kate! I love a no-sew project, any day! I’m linking up with your FIF now. Thanks for the invite! Love your blog!